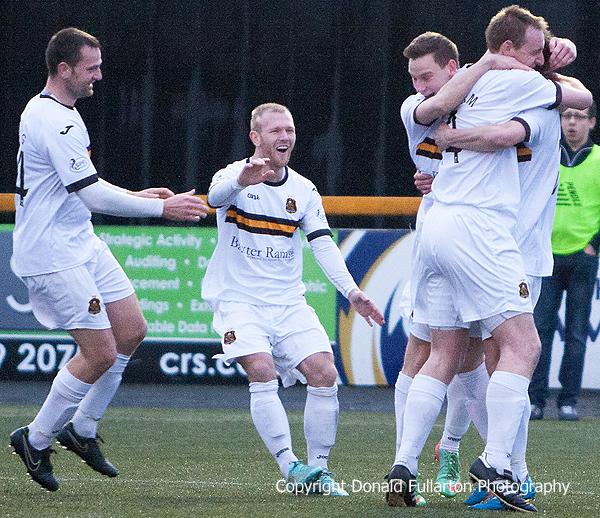 A DEADLY strike by Chris Kane gave Dumbarton an away victory over Alloa Athletic on a wet and dark afternoon. Sheer delight for Dumbarton after Chris Kane's goal. A DEADLY strike by Chris Kane gave Dumbarton an away victory over Alloa Athletic on a wet and dark afternoon in front of a 666 crowd. It was an important win for manager Ian Murray's men, keeping them in seventh place in the SPFL Championship and increasing the gap from eighth-placed Alloa — who shocked Rangers in the midweek Petrofac Training Cup semi-final in midweek — to four points. The visitors scored what turned out to be the game's only goal after nine minutes. Skipper Andy Graham floated a header across the goalmouth to the on loan St Johnstone striker, and he netted with a clinical finish. From that point on the game became a ding-dong battle, with both sides attacking at every opportunity and Alloa occasionally coming very close to scoring. In the second half, and under Scottish senior football's poorest floodlights, the pressure on both defences was almost relentless, but good goalkeeping and committed defending prevented any further goals. Dumbarton nearly added to their tally with a header and a shot by Chris Kane, and a piledriver shot from distance by Jordan Kirkpatrick.